A few years ago, a phone was good enough just for making phone calls and sending SMSes. If you went to a shop and saw two or more phones, you'd have very little option to choose between them. However, once the iPhone came along, everything changed forever. People started using their phones for listening to music, taking pictures, editing documents, and even doing presentations. Be it Android, Windows Phone or iOS, phones have been getting smarter and smarter each day. That said, no matter how smart their phones get, some people are never satisfied. They always want to get the most out of their smartphone and make it work in every way possible to improve life. If you're one of those people, you've come to the right place. 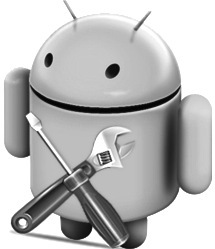 Because today, we're going to feature some of the best Android applications for Task Automation. What is task automation? Well, let's say you plug in your headphones. If your smartphone is good enough, it will lower the sound for you immediately. But once you take out those headphones, the sound level stays the same. Now the next time you watch a video without your headphones you'll have to increase the volume again. 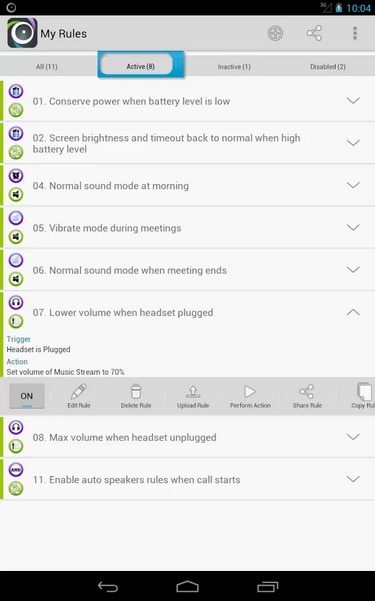 If you're using a task automator you can program the smartphone to respond to a certain event, so that you won't have to change the sound level time and again. Of course, when we say program we don't mean that you need to be a coder. These tasks can be easily set by any user no matter how inexperienced he or she is with technology. 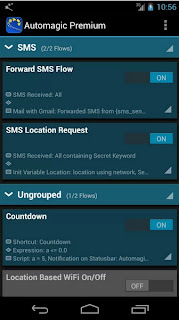 Automagic Automation is an application that lets you automate your Android device using flowcharts. Once installed, you'll be able to automate various tasks like turning Wi-Fi off when battery is about to run out, automatically reply to messages, make weekly backups, and more. What makes this application different from other automation applications is that the flowcharts present the tasks in an easy, clear manner, which never manage to confuse users. 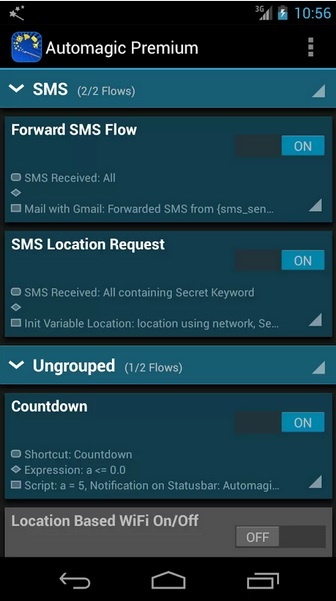 Tasker is a popular automation app that lets you automate everything from your settings to SMS. There are over 200 built-in actions in this application along with support for plugins. You can have triggers for apps, time, day of the week, timers, and more. What I personally love about this application is that it has a neatly designed user interface that goes well with Android's HOLO theme. 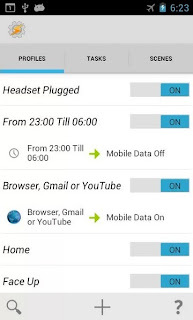 Another good thing about Tasker is that it can be used by any user be it starter or advanced. This is definitely one of the best applications on this list. AutomateIt is a simple, free application that lets you automate various tasks in Android. The app lets you define a set of behaviors that are activated in response to various events. The user interface of the application is really simple. You can either create your own rule or download some ready-made rules from the market. Personally, I prefer the latter. By default the application supports the following rules: Low battery warning, silent mode at night, normal sound mode in the morning, max volume when headset unplugged, lower volume when headset plugged, unmute by SMS. 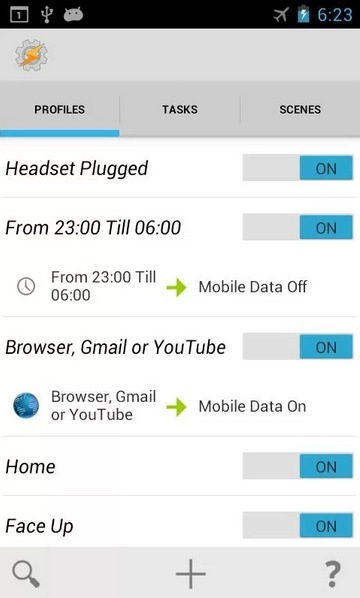 There are many other triggers that can be added to the application based on location, device connection (bluetooth devices etc. ), calls, battery levels, and more. 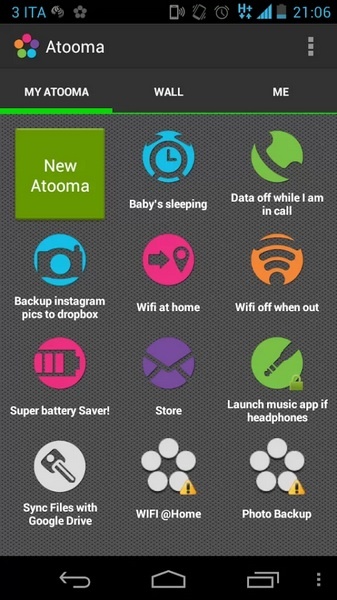 Atooma is a free application that lets you automate various simple and complex tasks on your Android device. 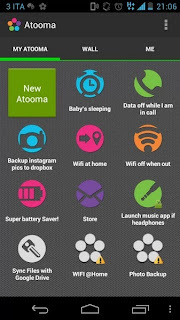 Apart from providing the basic set of tasks like switching Wi-Fi off, changing sound and more, Atooma also hooks up with your Gmail or Facebook accounts so that you can set triggers for events like mails with attachments or Facebook tagging. Once installed, you'll be able to create your own Atooma recipes or download some that are already created by other users. Also, you can submit your recipe to the public so that other users can download it and use it on their smartphones.